I’ve now hat the yummy privilege of chomping on Moab, Utah’s best pizza at Paradox Pizza three delicious times. In fact, the last time I was on the road driving for hours and had the chance to grab fast food from any of a number of other places, but chose to wait until I drove through Moab, knowing good it is. 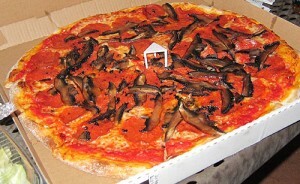 Check out this big musroom and pepperoni pizza! Click to zoom. Paradox is a pizza restaurant located on the south end of the small town of Moab, in a small shopping strip. They make New York style pies and even sell pizza by the slice. Along with the pies they have salads, bread, soups, appetizers and desserts. You can dine in at their tables or do what I did, take it to a local park and enjoy the outdoors while chomping. Paradox was recommended to me by a friend who is a pilot in the area who eats there several times per week. I now know why. When in Moab, take a break from your mountain biking and the associated “healthy” diet to chomp on a slice or pie from Paradox.